I’ve often mentioned the use of relative strength as one of the most powerful tools for a trader. Using the simple concept of relative strength, you can enter a position and have the “wind at your back”. But relative strength can also be a great signal for exits. 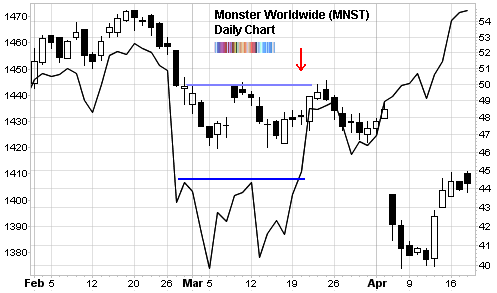 Take a look at the recent price action in Monster Worldwide (MNST). From Feb. until mid March it mimicked the S&P 500 (as denoted by the line chart which corresponds to the left price axis). It topped in mid February, fell in late February along with the wide market index and it then carved out a double bottom. But by March 21st 2007 (the New Year to some!) it was clear that MNST had lost its mojo. The S&P 500 powered ahead on that day with a wide range expansion candlestick which broke out of the trading range of the double bottom formation (above the blue line). MNST though barely eked out a positive day and definitely did not break out in the same way. As the red arrow indicated, MNST had “decoupled’ with the S&P 500.